Make an inventory of your cells with the cell check! Project Health's cell check is a real-time revolutionary method of measuring the bioavailability of trace elements, minerals, toxic heavy metals and oxidative stress. The cell check is based on spectral photometry and allows for a stable, reproducible measurement of the most important minerals and toxic metals, directly at the cell level. 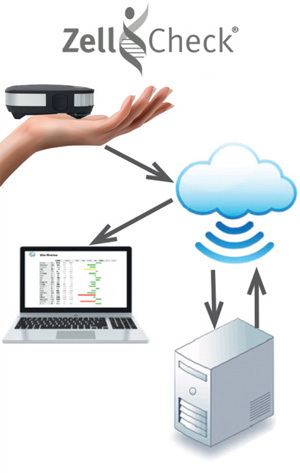 Therefore, cell check is a revolutionary tool compared to what is previously available on the market. Although the method is not new (recognized as early as the 1930s) and has been awarded a Nobel Prize, it is a revolutionary method of quantitative analysis for the way we now use it. The principle works as follows; Every chemical compound absorbs, emits or reflects light over a certain wavelength. The higher the concentration of the sample (of the pattern), the more light it absorbs according to the Lambert-berry law. 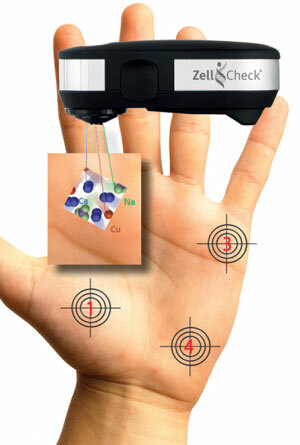 In practice, cell check can detect and measure the amount of different types of chemical elements in the cell. It uses emissions from characteristic frequencies of the respective tested chemicals (minerals, trace elements and heavy metals). 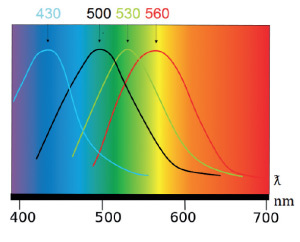 Each chemical composition absorbs light in a different wavelength (see chart). It has now been scientifically proven that trace elements, minerals and toxic heavy metals are stored in the cells and not in the blood. The cell-check spectrometer provides precise quantification of the intracellular memory of trace elements, minerals and oxidative stress. It thus replaces a blood analysis with regard to the determination of trace elements and minerals as well as the trichomineralogram (hair analysis), with which the heavy metals are otherwise analysed. 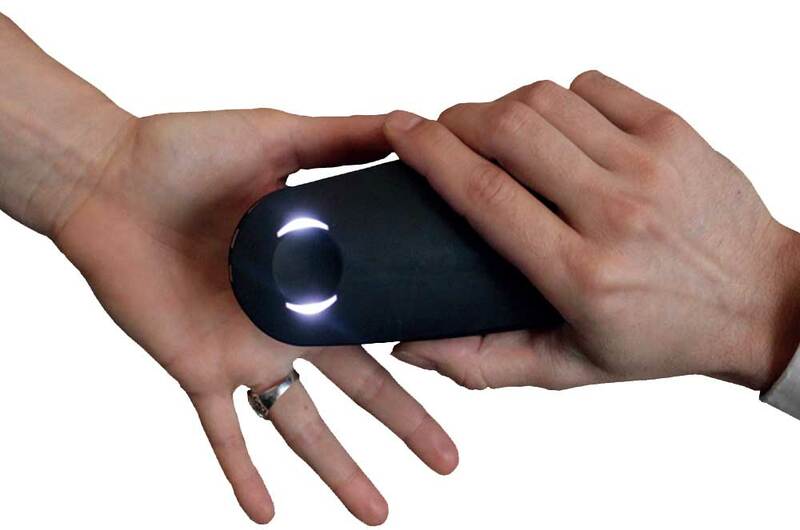 After reading the patient data, the spectral photometer is placed on four points of the palm of the hand, and this then emits light using a tungsten diode and a UV source, which then detects the corresponding parameters. The measurement includes 20 minerals and trace elements as well as 14 toxic heavy metals, the level between free radicals and antioxidants, and 14 medical parameters. What does the cell check bring? The negative effects of heavy metals on the human organism are evidenced by numerous publications of global research institutes as well as by specialized doctors. Heavy metals remain in the cells (especially in the brain neurons, pancreas, liver, lungs and kidneys) for a lifetime, where they also cause damage. They are responsible for serious diseases such as Alzheimer's, Parkinson's, auto-immune and degenerative problems as well as hair loss, skin problems, severe fatigue and migraines. They are also the largest suppliers of free radicals, which in turn are responsible for more than 200 serious diseases and ailments. The detection of a nutrient deficiency or exposure to heavy metals has so far been time-consuming, expensive and, in some cases, only indirect and thus inaccurate. With the cell check spectrometer, a revolutionary technology based on spectral photometry, a stable, reproducible measurement of the most important minerals and toxic metals, directly at the cell level, is now possible. In addition, well-researched interactions between minerals and metals can detect and remediate possible disturbances of physiological systems. All physiological processes of the body such as energy production, detoxification, immunity, cellular metabolism, hormonal regulation, etc. depend, among other things, on minerals, trace elements, vitamins, proteins and fatty acids. If these micronutrients are fed suboptimally, poorly absorbed or leached by increased oxidative stress, metal poisoning or other stresses, the risk of disease development can be increased. Conversely, it can be assumed that an optimal supply of nutrients can contribute to the maintenance of health. The measured data is transferred to a central security server. The desired results are available online in less than a minute in electronic form. 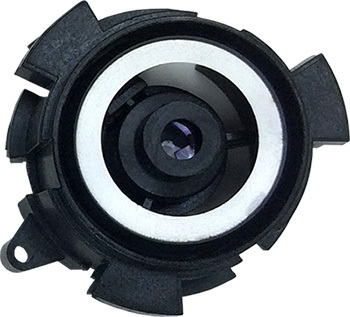 Specification: 93/42 EEC | Class IIa. Deficits or surpluses are shown in real time. 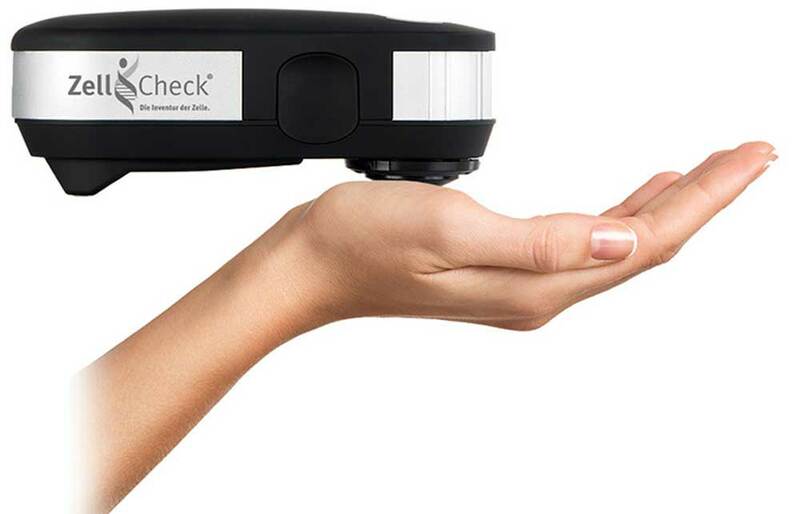 The vital substance check is a very striking evaluation form of a cell check measurement. In semi-circle diagrams, the measured values (e.g. oxidative stress, acid-base balancing, total exposure of toxic metals, etc.) are shown in the traffic light system. 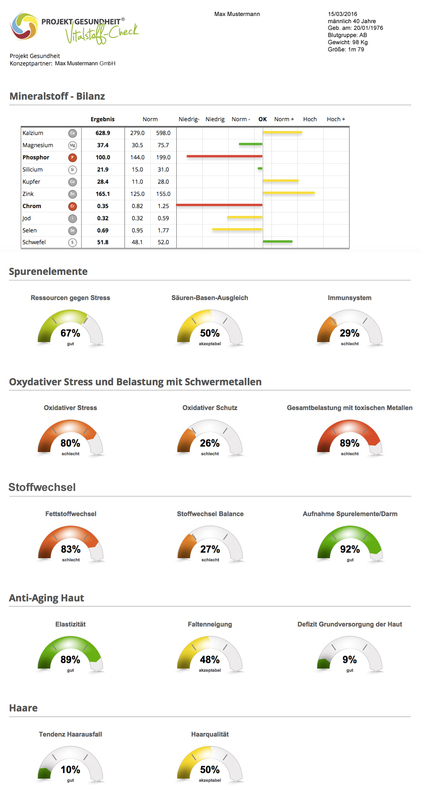 After a measurement has been carried out, the test person can be very clearly understood in real time and visually, as possible deficits or surpluses can be shown.